Perfect dish to support your health and beauty. Natto is a vegan source of high-quality protein. Mulukhiyah contains 8 times as much calcium as spinach, and of course rich in vitamins. I am sorry if you don't like this gooey texture, but believe me! 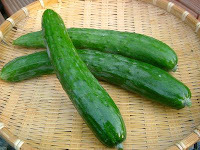 It is nutritious and rich in protein!!! This recipe is very easy, so I will give you some nice tips, so don't miss them! 1. Remove the Mulukhiyah leaves from the stems. Wash the Mulukhiyah leaves in cold water and drain well. 2. Bring a pot of water to a boil. Add a bit of salt (the salt helps the Mulukhiyah to retain its bright green color) and sesame oil (the oil helps the absorption of carotene). Boil the Mulukhiyah for a few seconds. Drain well with paper towels (do NOT wash because you don't want to wash out the Vitamin C). 3. Put Mulukhiyah, Natto, seasoning sauce, soy sauce, and ground white sesame seeds in a bowl. Mix well until gooey. Adding a hint of ketchup makes the mayo sauce very tasty and refreshing!!! Great recipe for your bento box. 1. Deshell, devein, and wash the shrimps (remove the tails). Dry well on paper towels. Season in order with A, Katakuriko (starch), and cooking oil. 2. 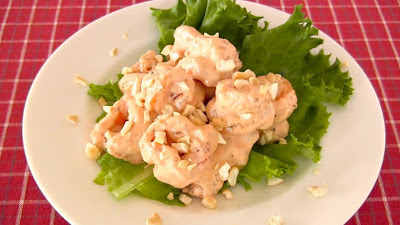 Grill the shrimps in the oven at 200C (392F) for 7-8 min, or on a BBQ grill, grill pan, or toaster oven. 3. Mix B in a bowl, add the grilled shrimps, and toss well. If available, place the cashew nuts in a plastic bag and break up into small pieces with a rolling pin. Then sprinkle them on top of the shrimps. Very easy Japanese recipe! You must try it!!! Currently, more than 60 people have made this and said good! You can find their photo reports down this linked page. 1. Bring a pot of water to a boil, then dip the tomatoes in hot water for a few seconds to soften the skin. Drain well and wait until they cool down. Then peel off the skin with your hands. 2. Place the tomatoes in a Ziploc (or any) container and pour concentrated dashi stock over them. Toss lightly. Chill for 1 hour or longer. 3. 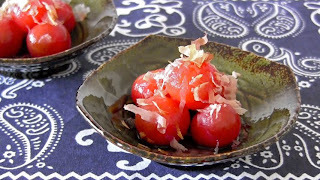 Serve on a dish, and sprinkle with katsuobushi if you have. Cómo hacer guacamole Japonés muy fácil y delicioso! I used wasabi instead of chili, cayenne pepper, or any hot spices. 1. Bring a pot of water to a boil, dip the tomato for a few seconds to soften the skin, then peel. Seed tomato and cut into small pieces. 2. 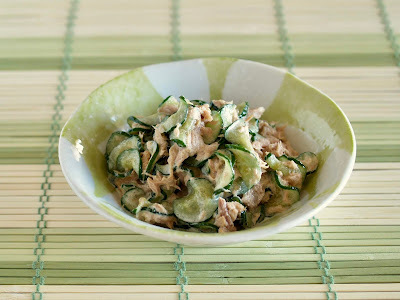 Cut red tuna into small pieces. 3. Using a fork, roughly mash the avocado. Add lemon juice (to prevent browning) and mash some more to coat. 4. Add Usukuchi Shoyu (light-colored soy sauce) and Wasabi mixture and sesame oil. Using a spoon, gently mix to keep the flavor of wasabi and sesame oil. 5. Then, fold in tomato, tuna, and freshly grated Parmigiano-Reggiano. 6. Sprinkle some chopped green onion (if preferred) and serve immediately with tortilla chips. 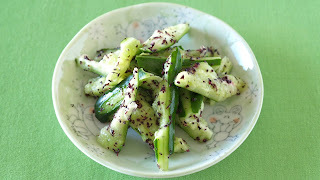 *Another way to serve: Serve on top of toasted baguette slices with Shiso leaves! Sprinkle white sesame seeds and/or chopped green onion if available. I topped "Spinach Ohitashi" on tofu and decorated with colored peppers. 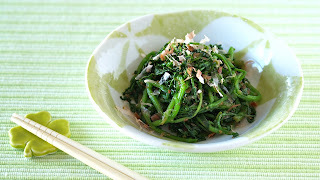 Spinach Ohitashi is a common dish cooked in Japan. It is a boiled spinach flavored with soy sauce. 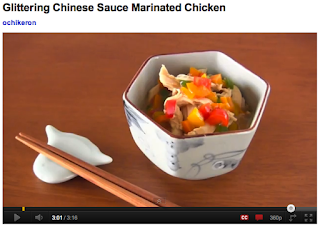 However, in this tutorial, I used vinegar and spices to season, so the flavor is unique. 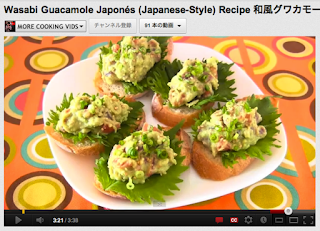 Please watch Lady Gaga Bento video for the basic "Spinach Ohitashi" recipe. 1. Boil water in a large pot. Add a pinch of salt in the water (salt removes oxalic acid - bitter taste, and makes the spinach nice and green). 2. Wash spinach and add in the boiling water from the stem side. 3. Boil spinach for about one minute. Drain and soak the spinach in cold water (or use running water) to cool. Drain and squeeze the spinach to remove the excess water (use paper towel if you have). 4. Cut off the root ends of the spinach and cut into small pieces. Toss the spinach with A. 5. 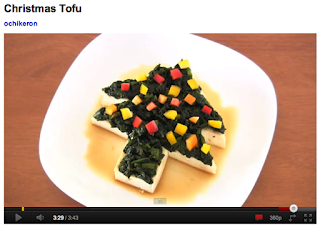 Drain tofu, slice tofu widthwise, and cut it into Christmas tree shape - please watch the video to see how. 6. 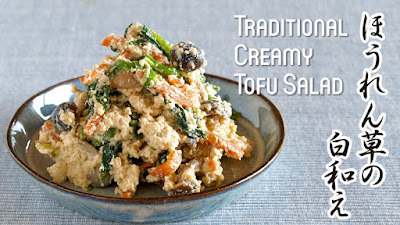 Top the tofu with spinach and decorate it with diced bell peppers (ornaments). I won the special prize at Kadoya's sesame oil contest organized by Cookpad. 828 recipes were submitted at the contest, and luckily mine was selected! 1. In a boiling water, put A and cook the chicken for 5 minutes. OR In a heat-resistant container, rub A on chicken. Cover with plastic wrap and microwave on Medium 500 W (50-60%) for about 2 minutes. Allow to cool slightly, then shred. 2. Chop bell peppers into small pieces. 3. Heat B in a pan, add bell peppers (2. ), turn off the heat, add starch with water, heat again to thicken the sauce, then season with sesame oil and cracked black pepper. 4. Put the shredded chicken (1.) in the sauce (3.) and marinate. I remember that I translated this recipe here before but didn't think it was back in 2008! Time flies!!! Many people asked me for an easy bento recipe, so this is the one! 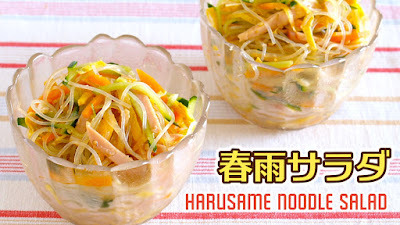 In this tutorial, I will use ohitashi which is a common dish cooked in Japan. It is a boiled leaf vegetable (usually spinach) eaten with soy sauce. In my video, I used Kamada Dashi Shoyu (dashi flavored soy sauce) for the seasoning which you can create an authentic Japanese dishes easily!. Try out if you get a chance! 2. Wash komatsuna and add in the boiling water from the stem side. 3. Boil spinach for about one minute. Drain and soak the spinach in water to cool. Drain and squeeze the spinach to remove the excess water. 4. Cut spinach into about 1.5 inch lengths. 5. 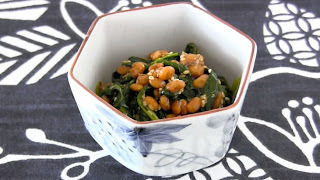 Toss the spinach with Kamada dash soysauce and ground sesame seeds. BTW, I noticed recently that YouTube freezes the view counts at around 300 for few days (sometimes up to a month). I kind of looked forward to seeing how many people viewed my videos, so too bad X'( As a YouTube user, I become to know some facts (not gonna mention but there are more...) that I didn't know as a viewer, which sometimes make me feel bad... but thanks to all the comments from subscribers and my darling's support (he always says "take it easy! it's not your work" haha), I feel positive creating another video soon. Anyways, yesterday was Marine Day (national holiday), so I had a little fun with my darling for a change :D Maybe I will write about it tomorrow! 1. Cover and soak the wakame in cold water for about 5 minutes until it softens. Wash and drain the wakame, cut into bite-size pieces, and set it aside. 2. 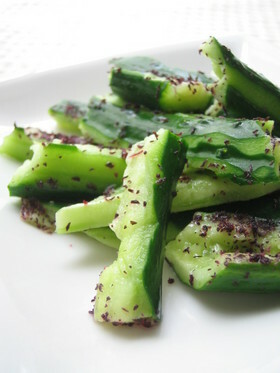 Slice the cucumber into thin rounds using a vegetable slicer. Put salt over the cucumber rounds, mix well, and leave for about 10 minutes until they soften. Wash and squeeze out the excess water. Dry with paper towels if you have. 3. 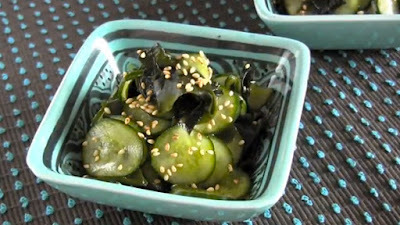 Toss wakame and cucumber rounds with Riken oil-free aojiso dressing (or dressing of your choice). 4. Place in a dish and sprinkle sesame seeds. I will be leaving for NY from Friday (tomorrow), so I will be away for a week! 1. Boil water in a large pot, break tofu into chunks (with your hands), place in boiling water for about 2 minutes, drain in a colander, cool enough, and chill in the fridge until ready to serve. 2. Mix A in a bowl and dress the tofu. 3. 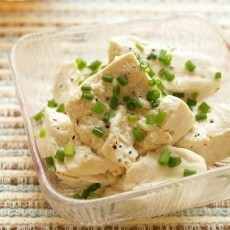 Serve in a dish and garnish with chopped scallions and white sesame seeds. By boiling tofu, you can remove excess water! Thus, it can absorb the seasonings well!! !